“Post-harvest innovations can make important contributions to addressing the global challenge of malnutrition,” begins Busie Maziya-Dixon, leader of RTB’s cluster on Post-Harvest Innovation (CC4.1) and Food and Nutrition Scientist at the International Institute of Tropical Agriculture (IITA). 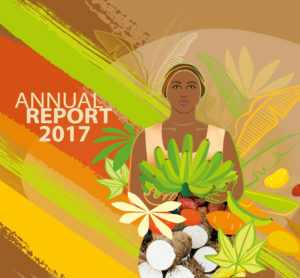 “In collaboration with other flagships, the goal of our research is to contribute to improving diets and income and employment opportunities for at least one million households through post-harvest innovation and better utilization of nutritious roots, tubers and bananas by 2022,” she adds. RTB is structured around five flagship projects, each of which is comprised of a number of research teams, known as ‘clusters’. To launch the Post-Harvest Innovation cluster, more than 20 researchers from 11 countries in Africa, Asia, Latin America and Europe came together in Entebbe, Uganda on 8-9 June 2017 to share experiences and develop a joint vision and research for development agenda that will guide their collaboration over the coming years. The team will investigate the myriad technical, environmental, social and economic dimensions to fully understand the opportunities, scope and potential impacts of postharvest interventions. Shared post-harvest challenges for RTB crops, such as post-harvest losses and waste product management, will be approached from a cross-crop perspective. The cluster will also undertake research in post-harvest management, storage, and processing of banana, potato and yam and support research for cassava and sweetpotato that is conducted in collaboration with other research teams. “This cluster exemplifies why we need the RTB program in the first place,” says Simon Heck, leader of Flagship project 4 on ‘Nutritious foods and added value’, under which cluster CC4.1 is housed. “Roots, tubers and bananas share several post-harvest challenges, such as their perishability, bulkiness, and comparatively narrow range of utilization. They also share an enormous potential for expanding and diversifying their use in new markets including in urban fresh food markets and in commercial processing. Progress in these areas can be greatly accelerated by researchers and private sector partners working together across different RTB crops that share similar challenges and opportunities,” he explains. Participants came from IITA, the International Potato Center, Bioversity International, the International Center for Tropical Agriculture, Centre de Coopération Internationale en Recherche Agronomique pour le Développement, Natural Resources Institute and government partners from Uganda and Nigeria, and included food scientists, breeders, market economists, agronomists, nutritionists and social scientists with ongoing research work on banana, cassava, potato, sweetpotato, and yam. The meeting also reviewed results and lessons from the RTB-ENDURE project in Uganda which concluded in December 2016. With financial support from the European Union through IFAD, RTB-ENDURE has provided an early, compelling example of collaboration between RTB partners for post-harvest innovation and several achievements are ready for scaling and will be integrated into the work of the post-harvest cluster team. One particular example discussed in Entebbe illustrates the role this cluster already plays for the program and how technologies developed for one RTB crop can be extended to others. Sweetpotato silage technology was successfully piloted as pig feed through Silage Business Centers in Uganda and will be expanded to utilize by-products and waste from other RTB crops, as demand for animal feed continues to grow. This will increase overall productivity of RTB-based farming systems and contribute to nutrition and income goals, including for women who are the main owners and managers of smallholder livestock in many countries. Research under cluster CC4.1 aims to develop effective silage for different root, tuber and banana crop combinations and different types of livestock, as well as explore business models involving rural youth as specialized silage producers. This will be done in collaboration with researchers from the CGIAR Research Program on Livestock. The Entebbe meeting emphasized the urgency, for the entire RTB program, to recognize the central importance and power of consumers and other end-users in today’s rapidly changing food systems. Cluster CC4.1 will seek to catalyze multi-disciplinary dialogue and collaboration around this central opportunity involving different RTB research teams and partners from universities and food industries. The goal is to enable innovations that harness the full potential of RTB crops for future markets, and do so in a way that is sustainable, equitable, and contributes to meeting global nutrition and economic challenges. Over the coming months, the cluster team will consult with partners and stakeholders in Uganda, Nigeria, Peru, and Vietnam to identify strategic opportunities in these countries where important RTB post-harvest research is under way, and to help finalize a global research agenda for RTB in this area. This entry was posted in News, News & Events on Jun 22, 2017 by RTB.